SIR Elton John and David Furnish “don’t have a clue” which one of them is the biological father of their new son Zachary. The delighted new parents said they had both “contributed” to the surrogacy birth of their little boy. Proud Rocket Man Elton spoke about the arrival of his three-week-old baby in an exclusive chat with OK! magazine. The keen football fan said he was already looking forward to taking Zach to his first match and revealed that he often sings to the baby. 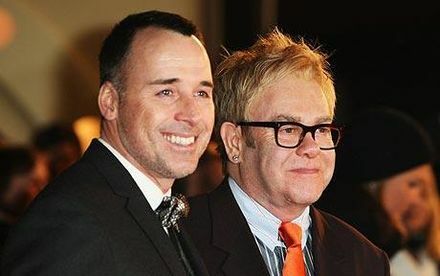 Elton, 63, said: “David and I have always been close but this is the last step in completing us as a family. “It ties us together,” he added. “And there’s not a bigger responsibility in your life than bringing up a child. Tiny Zachary Jackson Levon was born to a “smart, compassionate” secret surrogate mum in California on Christmas Day, said his besotted dads. David, 48, who got hitched to the singer in a civil partnership ceremony in 2005, added: “We both contributed to the pregnancy. The singer, who has a fortune worth over £200 million, is currently living in America but he said that he wants to bring up little Zach in England. He said he cried when the couple were finally able to take their son home from hospital, revealing: “I’ve never felt anything like it in my life. You’re so awestruck. “The feeling, the joy, the warmth of his body, his breathing. I will never forget that experience.” They also revealed the huge “covert operation” to keep their family plans top secret. David would regularly travel to America to meet the expectant mum, while Elton stayed away to avoid attracting attention. The couple told how they even shipped all their baby goods (which included mattresses) into their home disguised as Christmas presents. David also said: “We had to be interviewed by psychologists. Then our surrogate chose us from an anonymous profile. It’s her choice too.